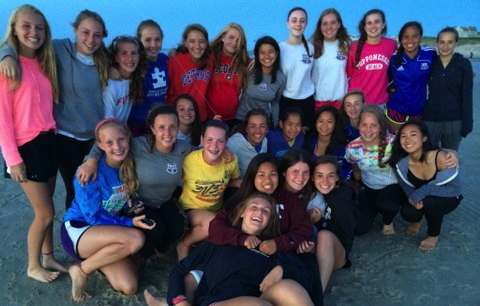 Aaaaaaand the Brookline High Girls Varsity Soccer season starts today. Chairs in the trunk. Check. Sweatshirts in the trunk. Check. Raincoats, umbrellas, sunscreen, baseball hats. Check, check, check, check. We had a rather rough(read: all kinds of BAD) season last year, but with a brand new coach, who seems to worship soccer the way my daughter does, this is already a better season (and it hasn’t even begun). Peter and I try to go to every game. Hopefully, my bunion surgery will not prevent me from watching (how would it do that?) I just mean that I hope that I’m not in so much pain that I’m yowling and all sorts of cranky pants, making the other parents scared, and maybe making them want to call, like, Animal Control, because I’m such a beast. Anyway, soccer is good. Soccer is great. And with any luck, we’ll get to the playoffs this year. And I will have a brand new foot by the time the season ends. That’s the goal. Hahahahahah.